Orland's Overture: Woohoo! I Won! As with our children’s afore mentioned food allergies, we cannot buy any bakery cakes. Therefore I have been improving my skills in the cake decorating category so that my children can have special birthday cakes. So when our ward was having a dessert contest, I figured it would be a good reason to practice some more. 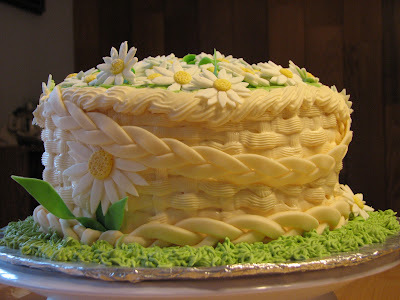 This is the cake that I entered. I thought it was a cute idea. I’ve wanted to make this cake for a while. For all of you perfectionists out there, (like me…in some cases) ignore all the imperfections. 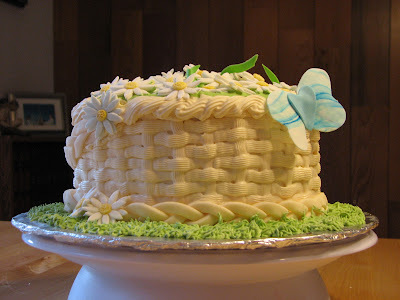 I am using the excuse that my materials weren’t the best for decorating cakes (I know…I also need more practice!). Someone told me Royal Icing (that's just water, powedered sugar, and meringue powder) would work and I thought I would give it a try. It was a little too heavy, but it worked well enough. Except for the parts that started falling off the cake! I won first place in "Best Presentation" and "Originality". I got a 20 out of 20 in the presentation category. But as for taste and texture I didn't even place. I am not surprised though. I tend to not make my cakes too sweet so that you can enjoy an entire slice with all the icing, and when a cake is made from scratch with no preservatives or soy it never tastes as rich. But it is truthfully healthier for you and I am good with that. 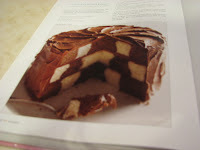 I call it the Checkerboard cake and it is surprisingly simpler than you would think. Oh...and I got second place in the overall category! Now while I am tooting my own horn, don't think that I beat out all these amazing deserts. I was the only one who came with a decorated desert and some of them were store bought. I wasn't going to post anything about winning but then I thought, "Hey, why not? What's the use of a personal blog if you can't brag every now and then." Hee Hee, I know... I'm a dork." We love and miss you all! Thanks Mom for all the decorating lessons! Wow Sis, you did a beautiful job! Congrats on your win! I'm sure it taste just fine...people in this country aren't used to eating heathly. Love You Guys! I love your cake! You are so talented! I love the braided handle. WOW!! At least two of you are doing cakes. ELena made Brody's first birthday cake, adn it was so cute and tasted good too. I was surprised that it was edible. We miss you!!! Glad you guys blog!